Earlier this month I joined more than 400 Baptist from more than 40 nations in Jamaica. With the national motto of "Out of Many, One People"” the island nation served as a fitting place for the Annual Gathering of the Baptist World Alliance (BWA). We lived out this theme each day during the morning worship services as we listened to scriptures read in multiple languages, and we joined in with responsive readings and songs offered simultaneously in multiple languages. As our words mixed together and poured upward, it became a small taste of some depictions of the nations worshipping in Heaven. Although we came out of many nations, lands, and cultures, we are one people in Christ. As the BWA’s logo notes - borrowing from Ephesians 4:5 - we are united by "one Lord, one faith, one baptism." Churchnet, a member body of the BWA, was well represented at the gathering with Executive Director Jim Hill and Vice President Forestal Lawton also at the week-long event for meetings, forums, worship, and fellowship. Hill serves on the BWA’s Promotion and Development Advisory Committee, as President of the North American Baptist Fellowship (a regional BWA body), and presided over the NABF's meeting in Jamaica. Lawton leads the BWA’s Men’s Department. I serve on the BWA's Communications Advisory Committee and spoke at a Communications Training Seminar for Jamaican Baptists that was hosted at a local Baptist church by the BWA and the Jamaican Baptist Union. 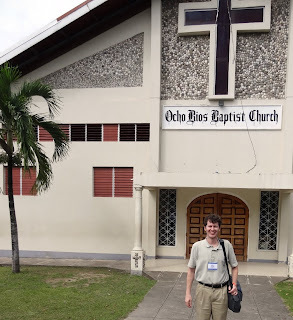 In addition to the morning worship services, another highlight of the week for me was the day at spent at Ocho Rios Baptist Church for the Communications Training Seminar. Appreciating the opportunity to leave the conference hotel and visit with Jamaican Baptists at a local church, I enjoyed fellowshipping during breakout sessions, lunch, and coffee breaks. Listening to the discussions, I heard fresh perspectives about communication, news, worship, and church. I also enjoyed getting to lead a session on writing news articles and press releases. Communication - which in English shares linguistic connections with communion and community - can be a sacred act that both helps us relate to God and to our neighbors. Between worship times and meetings, the BWA's Annual Gathering also provided times to learn about important global issues. For instance, I attended a session on Baptist-Muslims relations in the Middle East where I heard from speakers from various nations, including a Lebanese Baptist and the General Secretary of the European Baptist Fellowship (a regional BWA body that includes Baptists in Israel and the Palestinian Territories). In another fascinating session, I learned about Sam Sharpe, a Jamaican revolutionary hero, as speakers from Jamaica, the United Kingdom, and the United States offered insights based on their research. Sharpe, a black Baptist in the 19th Century, led a nonviolent revolt among enslaved persons often called the "Baptist War" since many of the leaders were Baptists. Although Sharpe and other enslaved persons were executed because of their strike for wages, the violent against them ultimately helped lead to the abolition of slavery in Jamaica and throughout the British Empire. Inspired by the story, I brought home as a souvenir a Jamaican fifty-dollar bill that features Sharpe. Hopefully more people will learn of Sharpe's nonviolent witness for justice and freedom. Justice, truth be ours forever. You can contact Brian Kaylor, Churchnet Editorial Assistant, at (888) 420-2426 ext. 704 or at bkaylor@thechurchnet.org. NOTE: To see more photos from the BWA Annual Gathering in Jamaica, check out the photo album on Churchnet's Facebook page here.